Get out your tabletop fans and your ice chests, folks! It’s that time of year again–the time of year when I start whining about how hot and sticky it is outside and how it makes me so lazy that I don’t want to cook anything. This is pretty pathetic of me because I don’t live in Arizona or Las Vegas or Texas or any of those places that turn into furnaces/swamps/tornado alleys in the summer months. Colorado weather in July (90-something degrees and arid) would seem like paradise to some folks right now, and here I am bitching about it. Maybe it’s this old age thing? I’m noticing that as the years tick by, my tolerance for extreme temperatures is narrowing. I mean, narrowing so much that if the mercury doesn’t fall between 45 degrees Farenheit and 80 degrees Farenheit, I’m a crotchety, frothy old tart. I pity my husband and his empty stomach this time of year. At least in the snowy months, I feel like cooking. I hole up in the house and putter around the kitchen for hours, quite content. 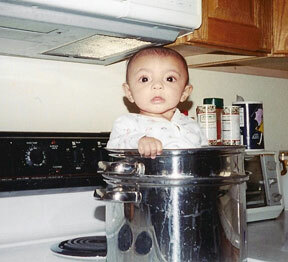 By dinnertime, I have a healthy appetite for that tender, slow-braised beef shank or that long-simmered kettle of soup. Those are good eating months, to be sure. Late July and the entire month of August? Ha! I’m lucky if I can drum up the enthusiasm to slap a sandwich on the table. My husband will come home at the end of a long day and find me sprawled out on the couch like a bloated codfish. “Ugh, is it dinnertime?” I mumble, pressing a cold cloth to my forehead. “Who can eat in this weather?” Then I’ll wave several takeout menus in front of his face and beg him to decide on the evening meal. After a few days of that ^^ routine, though, I start to feel ashamed of myself. Me, a grown adult, pouting in such fashion. Surely, I can do better. It usually involves a little strategy, like doing the grocery shopping and most of the meal preparation in the early hours of the day, when the cool mountain air still flows through the screen doors and I haven’t yet lost my will to survive. When things get sizzly, I find myself turning to Asian flavors more often than not. There’s something cooling about the cuisines of Thailand, Vietnam and Korea…probably because those countries get absolutely sweltering for months out of the year. When it comes to keeping cool, those dudes have things figured out. It’s time to serve things chilled or at room temperature, time to spike up the sweat glands with chile and then cool it with mint or some other fresh herb. It’s time to keep it fairly simple, as long as you can plan ahead. 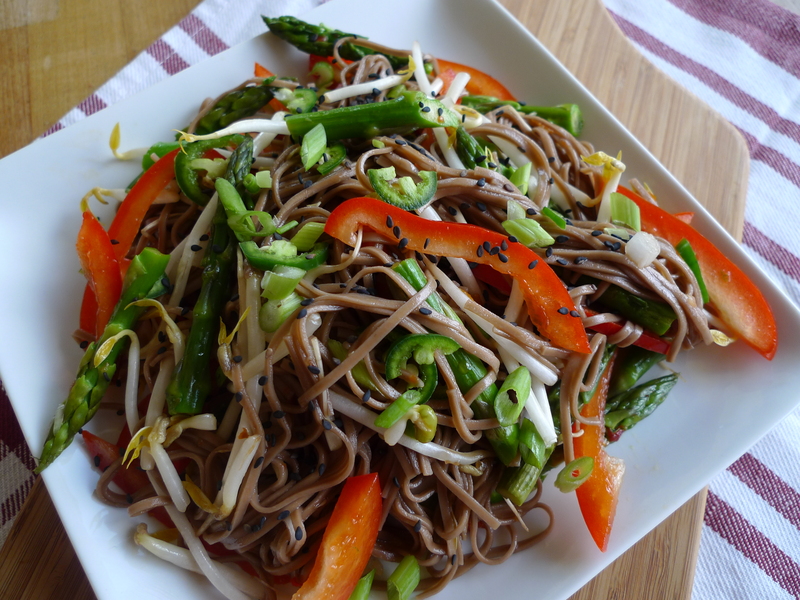 This recipe for soba noodle salad fits that bill and is extra sneaky because it’s so adaptable. You can serve the dish as is or amped up with your favorite protein. When it’s truly blazing, I usually rely on shrimp, since I can either poach shrimp in the morning and serve it later, on top of the salad or throw some skewers on the grill for a mere 3 minutes and then dash back inside to the air conditioning. Marinated tofu, leftover rotisserie chicken or even edamame are also genius additions. This salad is substantial enough to satisfy but light enough that you won’t feel weighed down. If you can’t be bothered to buy bean sprouts or asparagus, sub in other vegetables, like cucumber, radish, shredded carrot. This is a lazy meal, folks. Use whatcha got. Then grab a nice cold white wine or beer, or a refreshing Arnold Palmer, some chopsticks and a smile. Summer’s dog days are here, but they don’t always have to bite. Cook the soba noodles in boiling salted water as per directions. Drain and rinse under cold water. Set aside. 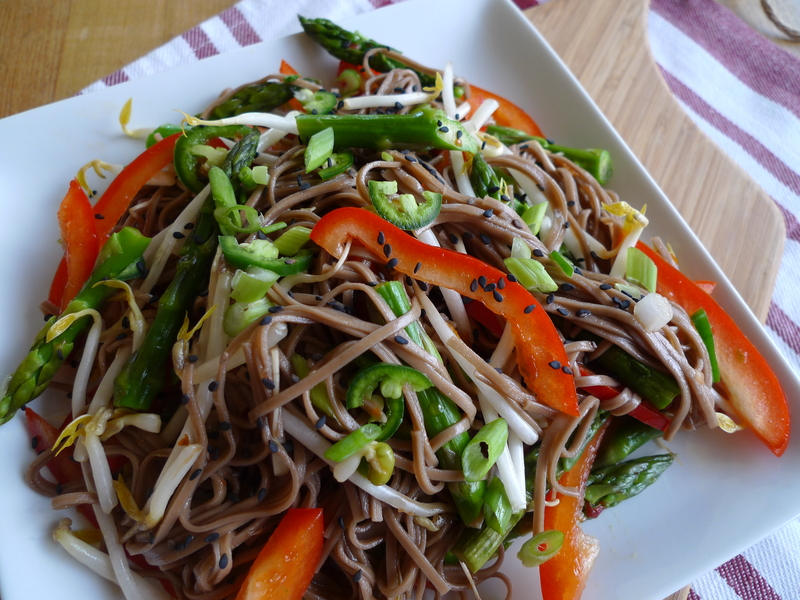 Combine noodles, red pepper, blanched asparagus, bean sprouts, scallion and jalapeno in a large bowl. In a small bowl, whisk together dressing ingredients. Toss with noodles and vegetables. Refrigerate 30 minutes to allow flavors to combine. Serve chilled, garnished with sesame seeds. Will this recipe help with THE CHANGE????!?! I just want it to get itself over-with SO BAD!!!! Sounds delicious! I said the same recently, that I’m starting to be unable to tolerate the heat. Once it goes over 85, especially if it’s humid, I turn into a high-end witch. And I love summer, so it’s hard realizing I can’t deal with heat anymore, more than just being crabby; it’s such a physical inability (which then lends to crabbiness). We don’t have central air, just a few window a/c units (that we don’t put in/use unless it’s 90+ usually). Whenever I say that to people, they look at me like I’m crazy. I can’t tolerate the heat, but I also can’t tolerate the higher electric bill (AND I use the over nearly daily). All that to say — I’ma try these noodles.